The following chart shows collective data from coaches in the Rick Barnes coaching tree 2007- 2010. These are former Barnes’ assistants that went on to coach their own teams. 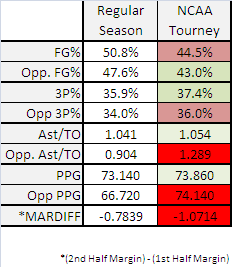 It’s separated by Regular Season vs. NCAA Tournament. Performance seems to drop off significantly in the tournament. Not every coach registered NCAA Tournament data and the chart does not include games from the 2012 tournament (even though they would prove my point even more). Coaches included: Rick Barnes (Texas; ’07-’12), Ken McDonald (W. Kentucky; ’07-’11), Frank Haith (Miami; ’07-’11/Missouri; ’11-’12), Dennis Felton (Georgia; ’07-’08), Larry Shyatt (Wyoming; ’11). While watching the ending to the Texas/Cincinnati NCAA tournament game, it felt like deja vu. Because it was. In other big games this season, Texas’ deficit followed a similar course. This is game-flow data (moving left to right) compared to the advantage/deficit in points at a particular time during the game. 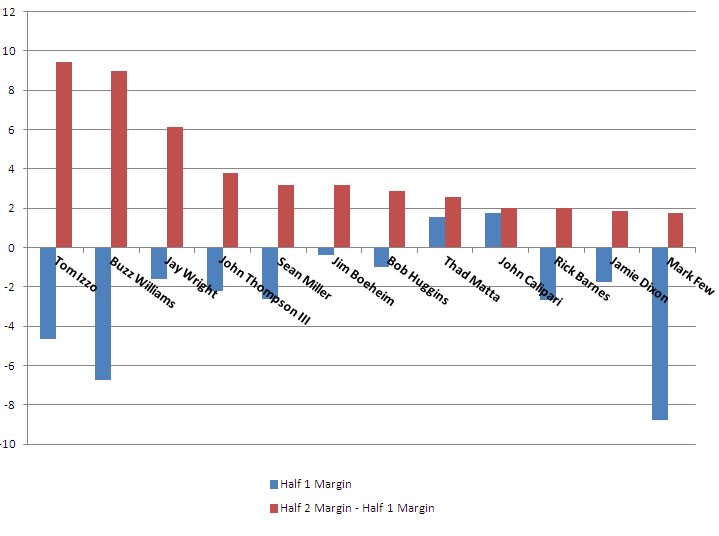 I’ve posted this chart before, but added the result from Gonzaga’s win over W. Virginia in the first round of the 2012 NCAA tournament on Thursday. The game in Pittsburgh required Gonzaga to travel 2,200 more miles than W. Virginia, who took an hour-long bus ride to the game. Based on historical data, Gonzaga shouldn’t have won by 22 points. In the NCAA tournament, teams face unfamiliar opponents outside of conference familiarity. Often times, teams struggle in the first half. But for some teams, the coaching adjustments prove to be the difference. 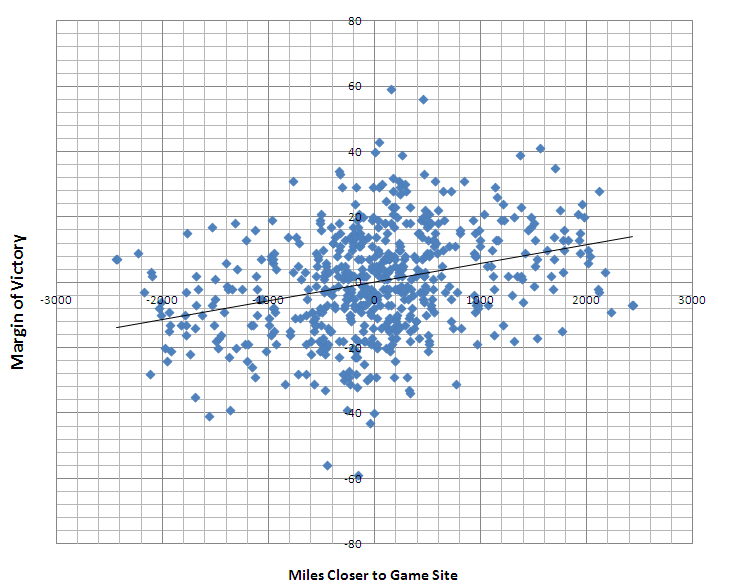 The chart below shows why most coaches would rather be a #2 seed close to home than a traveling #1 seed. 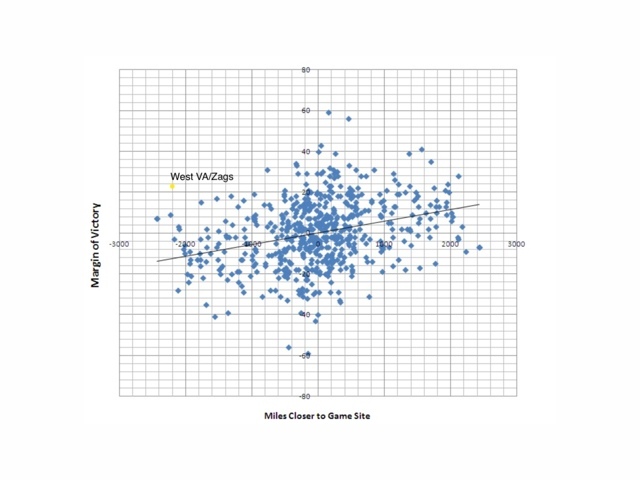 This data is for ANY team/seed, regardless of who’s favored. Check out this graphical representation of how busted each year’s bracket has been. 2011 was fun. Courtesy of @teamrankingsCBB and @statsinthewild. I had posted a while back about how much I liked the Utah Jazz but the way that they’ve been playing since Carlos Boozer came back has been disappointing. But with a coach like Jerry Sloan and with the 2nd best point guard alive in Deron Williams, I wouldn’t be surprised if Utah takes LA past game 5. I can’t figure out either of these teams so it makes sense that they will be playing each other in the first round. New Orleans has been consistently mediocre the entire season but because of their performance last year, they’re getting a lot of love in this series that they don’t deserve. Last year, Carmelo’s team was called the Enver Nuggets because they didnt have any “D”. But with Chauncey Billups, it’s gotten a little better. Denver in 6 because they’ll steal 1 on the road. AHHH… this feels like a Western Conference playoffs!! This is the most underrated series of all. Losing Manu Ginobili evens the playing field for the Mavs & Spurs. And for the first time, I feel like the Mavs actually have an identity on this team. They’re playing with confidence. Another big point about this series: Tony Parker is fast. But JJ Barea can keep up with him. I wouldn’t be surprised at all to see a 2 point guard set with Kidd & Barea for Kidd to run the point and Barea to guard Parker. I have more of a bias in this series than I do for my fave team, Mavericks. I want so bad for the Rockets to win a playoff series without Tracy McGrady. But they will have to stop the most underrated player in the NBA, Lamarcus Aldridge. Who will guard him? Scola?